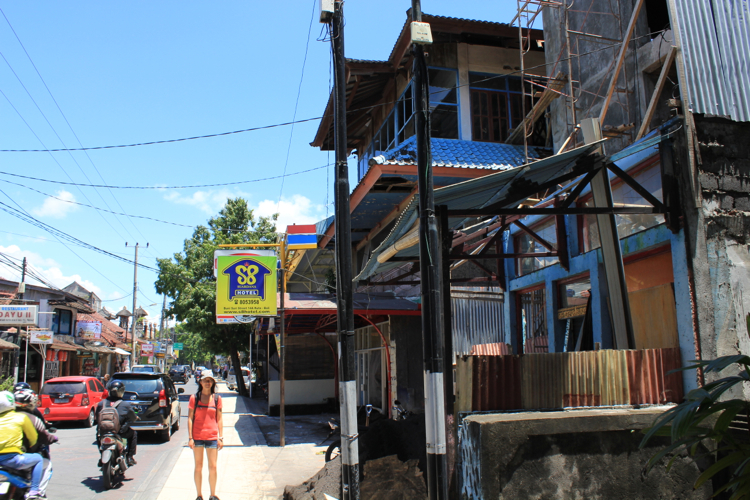 I was so proud of myself for booking a hotel in Kuta, Bali for $17 CAD/night. That’s $8.50 each! After staying in hostel dorm rooms for $34 CAD/night in Australia, it was comparatively a sweet deal. I was a little concerned about the condition of the hotel, but at that price, I couldn’t really get my hopes up. The hotel was a little out of the way from the main scene, there was construction right in front of it which made it kind of scary at night, and the steps to our room were very steep, but aside from that it was fine! We had a bed, a TV, a fridge, a couch, a washroom, air conditioning and free wifi. It was more than enough for a couple of budget travellers. I had only booked the hotel for 2 nights because we didn’t know what to expect from Bali and wanted the flexibility of checking out a different hotel or a different location if we felt like it. After familiarizing ourselves with the area, we considered staying for a few more nights at the same hotel… That was of course, until we heard a woman’s blood-curdling scream at 4:30 am on the second night. I distinctly remember it being two long and loud shrieks. As if someone saw a dead body, or quite literally, a ghost. It was the stuff horror movies are made of. I’ve probably heard a similar scream from… every single horror movie! The kind where some silly woman goes off into the dark and says “Hello…? Is someone there…?”, then she turns around, her eyes widen, she screams a screechy scream, and then the screen blacks out. I lay there in bed with my eyes wide open. I thought maybe I had dreamt the screaming, but I’m pretty sure I didn’t, especially because I was then hearing some sort of whimpering out in the echoey stairwell. I tried to calm myself down and go back to sleep, but my earplugs weren’t enough to block out the whimpering sounds. It also didn’t help that I was partially trying to hear if there was any movement outside, still wanting to convince myself I had imagined it all. My heart wouldn’t stop pounding. The more I thought about it, the more scared I got. I reached over to Adam, and realized that he was awake too. Me: Did you hear that…? My imagination ran wild. Adam heard it too, that means I hadn’t dreamt it… which is actually worse! I strained my ears to hear if anyone else in the hotel got out of their room to check things out. Maybe all the people we thought were hotel guests were actually in on it and we’re about to get eaten and/or sacrificed! I wanted to push the couch in front of the door, but I was too scared to move. (When we relived this memory, Adam said he had the same idea, except he was going to push the fridge in front of the couch too.) I told Adam I was going to turn on the lights, but he thought we should probably stay quiet and not draw attention to ourselves. I got up, grabbed my laptop, and immediately started looking for other hotels to stay in if we survived the night. Adam was doing something on his phone. I later found out he was trying to recharge the sim card he got from New Zealand (after first trying his Australian card) and started looking for the number to the police. Adam put another $20 on the sim card, but it didn’t last long because it was considered an international call. Still it was enough time for him to call the tourist police and explain the situation. Adam said he heard a loud bang followed by a woman screaming, and asked them to send someone to the hotel to investigate, but it was quite the challenge given the language barrier. He had to explain over and over again that we didn’t lose anything. The $20 ran out before he could finish the call, but the tourist police agreed to send someone over before it cut out. We heard sirens in the background, but we don’t know if they ever came to the hotel to check things out. The whimpering in the stairwell seemed to have stopped. Adam eventually went back to sleep, but I stayed up all night. I felt better once the sun came up, but I was still terrified. At that point, I thought that if there was a dead body, we would probably hear more of a commotion outside. Adam said we must’ve overreacted, and that maybe someone just tripped and stubbed their toe. I wasn’t convinced though, the scream was much too horrible. We got all packed up as soon as we could, went to check out and chatted with the receptionist for a bit. Adam asked if she heard a scream last night, and whether she knew anything about it. A couple was having a fight!!! Holy crap!! The blood-curdling scream was because of a fight?? Holy drama batman!! I couldn’t believe it!! The receptionist (Mimi) told us that in Indonesia, women are treated like queens. Whatever it was that happened, the girlfriend was not happy. 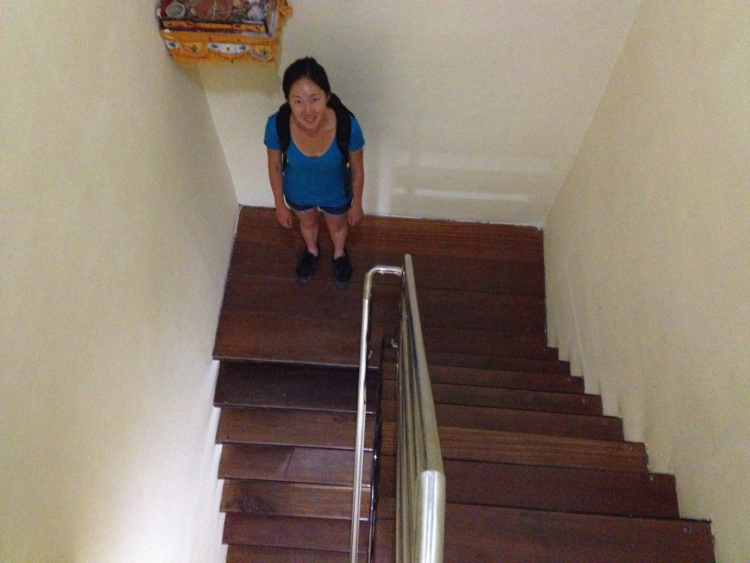 The whimpering we heard in the stairwell turned out to have been the woman crying! Mimi went on to tell us about how she used to work for a different hotel, and that she overheard a European couple fighting. The man said something along the lines of “How could you be like that?? I paid for everything!! I paid for this hotel, I paid for dinner” etc. etc. Mimi couldn’t understand how who-paid-for-what could be an argument, because apparently the men in Indonesia pay for everything. It’s just expected. I found it all very amusing, and felt rather silly at how scared I was. In hindsight it all made perfect sense (sort of…), but from 4:30 – 6:00 am, I was convinced someone saw a dead body or it was a menacing ghost. Those were my top 2 theories. My imagination is my worst enemy. It was a little bit awkward actually, because we did express interest just the day before that we wanted to stay a few more nights. We just acted as if we never had that conversation haha, but no I don’t think she made the connection. Julie, that’s quite a story. I always take these things seriously, and at night it’s even freakier! Glad you got to the bottom of it. I wonder if you were still at the hotel for extra nights. Nice to see you having fun Julie and thanks for the post card! I love it! You’re welcome Lemei! Postcards and snail mail are fun! Awww… I will go to Bali for my first time in next 2 week. Hope our hotel is away from those nightmares.